4.4.19 – Nick Brooks taught an excellent session here at the club and afterwards there were some well deserved promotions. Well done to Amer, James and Dion who were promoted to Blue Belt while Idan was promoted to Brown Belt! 9.3.19 – We’re pleased to have Nick Brooks, Head Coach at Mill Hill BJJ, back again to teach a seminar at our club and oversee some gradings. Open to all members. If guests wish to attend, just drop us an email. 28th February 2019 – It was our great honour today to promote Dean Pearson to purple belt. Dean began training over ten years ago at Mill Hill BJJ but took a few years break. When Borehamwood BJJ opened up three years ago Dean took the opportunity to get back into training and has been a regular member ever since. ’16th December 2018- Today we awarded our end of year Trophies to three of our star junior students: Winner of Most Improved Student in 2018 is Chase. Winner of the Team Spirit Award is Sophia. Our Student of the Year award goes to Anna-Maria. Well done to our junior students who we see all work hard and always do their best. The coaches and I are all very proud of you! 6th December 2018 – We are proud to announce that Steve Small was promoted to blue belt today by Seymour Yang. 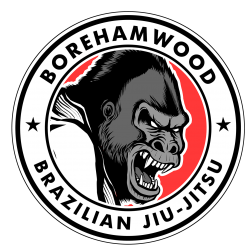 1st Dec 2018 – A wonderful day today from the Borehamwood BJJ juniors. Four members competed at the Bucks BJJ Open and our team came away with a fantastic three golds and one silver medal. The kids coaches and I are all extremely proud of the hard work and effort by all the participants. 30th November 2018 – We are open every session over December EXCEPT December 27th. 27th October 2018 – A great day out at the London Warriors Cup today for the club. Amer lost a very tough fight and picked up a silver medal while James had two fights winning the first on points to earn him a bronze medal. Well done to both competitors! 16th September 2018 – Seymour Yang and Steven Small competed at the National Masters BJJ Championships in Hereford today. It was a fun tournament with lots of action. It was also great to see several members travel several hours to show their support. 10th September 2018 – Five members of our club competed at the Hertfordshire BJJ Open. All five competitors gave everything they had on the mats. Grant Brown took silver, Ross Duncan bronze and Charlie Reynolds also bronze. Our club’s efforts helped contribute towards Mill Hill BJJ winning the team trophy! 20th July 2018 – From August there will be no more cash on the door option. Instead, users can purchase a £40 attendance card which covers any five lessons of their choosing. The card has no expiry date. Just see Seymour to buy one. Members can still pay via direct debit – DD users get extra perks and benefits such as free training at affiliate clubs, big discounts off branded merchandise and discounts off seminars. 1st July – Competition news! Today @bermisan took some of our kids over to compete at the RGA Bucks kids competition. All the kids fought their hearts out. Results: Oliver gold, Roma Silver, Daniel bronze and silver, Shay bronze, Alex bronze, Chase bronze. Superb effort by all some great skills and heart on display. Thank you to Sandeep for leading the kids comp team. Seminar news: on the 12th July at 7:30pm we will have BJJ black belt Alain Pozo teaching a leg attack class. He will cover IBJJF legal and non-legal attacks and set-ups. For more details, visit our Facebook event page. 21st June 2018 – Big congratulations to Marcel, Andrea, Wayne and Lucas on their blue belt promotions tonight. These four are the club’s very first homegrown blue belts, a landmark moment in the club’s two year existence. 25th March 2018 – It was a pleasure to award young Daniel his grey/white belt today after passing his test. Three members of our Juniors class competed today at the RGA Bucks Kids Interclub tournament. All three competed and fought their hearts out against tough opposition. Shay won gold! Ella and Roma both received a well earned bronze. We’re all very proud of their efforts! Thanks to Sandeep for organising the group. We are now taking bookings for new beginners to attend our 5-week Introductory Fundamentals Course starting 1st February 2018. Please book in advance as spaces are limited. See here for more details. The final adults class is Thursday 21st December. Back again on Thursday 4th Jan 2018. Congratulations to Maya who the kids coaches and I decided was a worthy winner of our Junior Student of the Year award. More fantastic news. Today three members of our club competed at the Hillingdon BJJ Open. Amer won gold, Marcel won silver and Jason took bronze. A wonderful performances as it was their first every BJJ tournament. Well done guys! An amazing day spent at the English BJJ Open. Three competitors and three medals: gold, silver and bronze! Well done to all three and thank you to all the members who came along to support! Congratulations to our newly promoted grey and white belt kids: Arron and Janaye both attended the required number of classes, then passed their grading test and were able to execute their game during sparring. The coaches and I are hugely proud of all our junior students as we see how they grow and develop their jiu jitsu skills each and every week. The Club Christmas Dinner and Drinks has been booked for the evening Saturday 16th December. For full details please speak to Seymour. Deposits for the event are required by the 16th November. 27th August 2017 – Many congratulations to our newly graded juniors: Aimee, Ella and Roma have been training at our kids class for over a year and, after a test, have all been promoted to their new rank of grey/white belt. 25th May 2017 – Our 5-week beginners’ course is now full. We hope to run another one later in the year. 1st May 2017 – Sign up for our beginners course in June…full details here. 20th April 2017 – Big congratulations to the kids who were awarded stripes today: Keren, Maya, Shay, Daedelus and Eli. 22nd April 2017 – Coming in June, a new beginner course. A 5 week program designed to give newcomers a head start with the fundamentals behind Brazilian Jiu-Jitsu. 21st March 2017 – we now have a YouTube channelwhere you can view all of the class highlight clips. There is also extended sparring and drilling time added on Thursday evenings: from 9pm – 9:30pm, for regular members only. 12th January 2017 – Check out our short promotional video here. 22nd December 2016 – I would like to wish everyone a Merry Christmas and a Happy New Year! 18th December 2016 – KIDS CLASS Promotions! Well done to the following kids class members for their stripes: Jada, Janaye, Ella, Roma, Jack, Ivor were awarded their thrid stripe on the white belt. Zoe earned her first white belt stripe. 8th December 2016 – The last class for this year will be Thursday 22nd December. For regular members there is no fee to pay for this class. The next adults session we are back will be Thursday 12th January 2017. The next kids class session will be Sunday 15th January 2017. 13th November 2016 – Check out the Kids BJJ Curriculum.It’s a work in progress but more or less complete as far as what is expected for white belt and grey+white belt. 6th November 2016 – Roma receives her second stripe! 23rd October – Kid’s class promotions! Aimee, Jada, Janaye and Ella all receive their second stripes. 16th October – Well done to Joe Hildebrand on his first stripe. 6th October – congratulations to Steve and Arjan, both received their first stripes. 2nd October – congratulations in the kids class where Aaron and Dylan both received their first stripe. In the adult’s class, Marcel receives his first stripe. 11th September – check out the club curriculum guideline. This is written more as a timeline guide to check what techniques are being taught that week. But it is subject to change and alteration as time progresses. Right now, we’ve just completed the segmenton takedowns so as you can see, the next section is the Turtle. 4th September – Congratulations to young Ivor and Jack who were awarded their first stripes today in the kids class. 21st August 2016 – Congratulations to Wayne, Andrea and Dion who were awarded their first stripes tonight. 10th July 2016 – Congratulations to our junior students who received their first stripes today! We will have Thursday classes (adults 7:30pm-9:00pm) and Sunday morning classes (kids 10am – 10:40, adults 10:45-12pm) at Maxwell Park Community Centre. See here for map and details of the new location. Saturday classes will still run as normal but will cease after June 11th. Check out the article I wrote on the topic of sparring in BJJ – here. 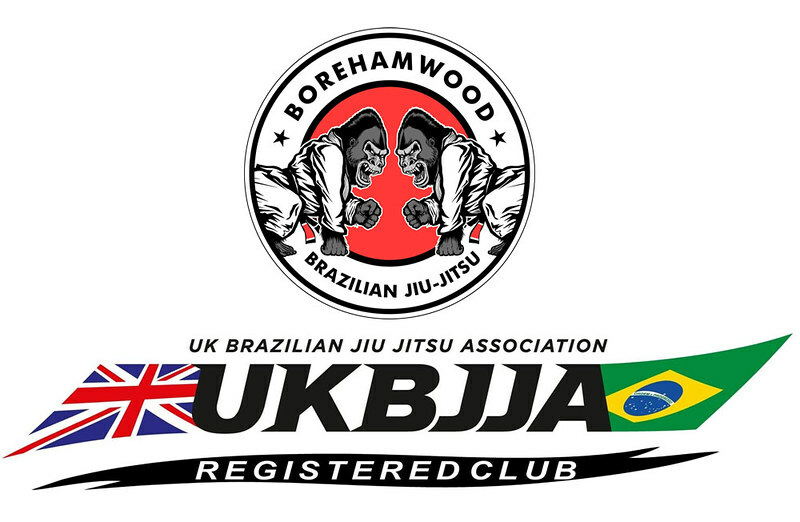 Thanks to everyone who attended the inaugural opening of Borehamwood BJJ yesterday. Classes are held every Saturday – 1pm for kids and 1:45 for adults. Complete beginners are very welcome!